Joining Marsh this episode is spiritualist and author of over fifty books, Theresa Cheung. Revitalising water, respiratory tract infections, homeopathy, and unnecessary antibiotics. Plus the Revenge of Frankenstein, hydrogen bonds, and mouth feel. Is this just nonsense? It’s Skeptics with a K.
Robin Ince’s first new stand up show in three years is a clash of the two cultures, a joyous romp through his favourite artists and strangest scientific ideas. From the work of Stanley Spencer to Niels Bohr, it is 90 minutes fizzing with ideas about creativity in science and art, as well as asking why we believe we see what we see and why we believe what we believe. 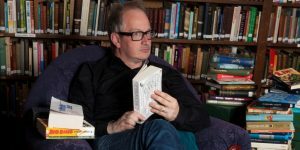 As well as being a prolific stand-up, Robin Ince is the co-host of the award winning BBC Radio 4 show Infinite Monkey Cage and author of several books, including I’m a Joke…and So Are You. He is the winner of the Time Out Outstanding Contribution to Comedy Award, as well as The Francis Crick Science Journalism Award and 3 Chortle awards. He recently finished a 70-date, record-breaking tour with Brian Cox that concluded at Wembley Arena. Acromial bone spurs, cancer awareness, pink beer, and adipocytes. Plus terracotta, physiotherapy, body shaming, and just air. Making you feel better without altering the underlying illness, it’s Skeptics with a K.